The defending world champion St. Louis Cardinals once again dominated the National League on the way to their second consecutive Fall Classic as Bob Gibson remained at the top of the list of National League pitchers. Along with his American League equal, the Detroit Tigers' Denny McLain, both had combined for a whopping fifty-three wins and nineteen shutouts (Gibson: 22 wins, 13 shutouts & McLain: 31 wins, 6 shutouts). As was becoming the standard, pitching dominated the World Series contest and nothing would change in 1968. 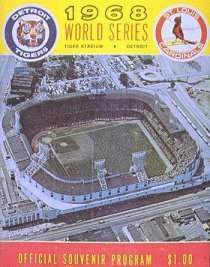 Both aces met in Game 1 as Gibson threatened to break Sandy Koufax's Series record by striking out thirteen Tiger batters through seven innings. McLain did not fare as well and surrendered for three, fourth-inning runs by the Cards, who got a run-scoring single from Mike Shannon and a two-run single from Julian Javier (thanks to an error by Willie Horton). In the seventh, reliever Pat Dobson, working his second inning, yielded a bases-empty home run to Lou Brock. Gibson remained in control with a 4-0 lead (while permitting four meaningless hits and no runs) and prepared to close the deal on Koufax's record. After sitting down pinch-hitter Eddie Mathews to open the eighth, the thirty-two year-old veteran made Al Kaline his record-equaling fifteenth strikeout victim, Norm Cash his record-breaking No. 16 and Horton his one-more-for-good-measure No. 17. Detroit bounced back in Game 2 thanks to seventeen game winner Mickey Lolich who held the "Redbirds" to six singles and added the only home run of his Major League career for the 8-1 win. Tim McCarver set the pace for the Cardinals in Game 3 and hammered a three run homer in the fifth to take a 4-2 lead. Orlando Cepeda followed suite with a two run shot in the seventh and Lou Brock stole three bases on the way to a Series-leading 7-3 triumph. Gibson returned for the fourth meeting and continued his unbeaten streak with a record seventh consecutive win in the Fall Classic. Embarrassing the Tigers 10-1, the right-hander aided his own cause with his second career homer in Series play (a record for a pitcher) while Brock dominated at the plate with a double, triple, home run and four runs batted in. The outfielder also recorded his seventh stolen base of this Series (tying a mark he had established in 1967). McLain was once again bested by his counterpart and was lifted after 2 2/3 innings to no avail. Although Brock's base running had proven to be a definite advantage in the previous four outings, his carelessness cost the Cardinals dearly in Game 5. After doubling with one out in the fifth, Brock tried to score standing up on Javier's single to left, but Willie Horton threw him out with a laser to home plate. Detroit, trailing by a 3-2 score at the time, seemingly received a boost from the reprieve and broke loose for three runs in the seventh. Mickey Lolich, who was knocked for a two run homer by Cepeda (in a three run St. Louis first), pitched scoreless ball over the final eight innings as Detroit stayed alive with a crucial 5-3 triumph. McLain returned for his third appearance determined to get his first win over the Cardinals' Ray Washburn. Pitching his best game of the Series, the Tiger ace finished a 13-1 victor thanks to a rally sparked Jim Northrup, who slammed a bases-loaded homer in Detroit's ten run blitz in the third. The Tigers' spree matched the one inning Series scoring record set by the Philadelphia Athletics against the Chicago Cubs in Game 4 of the 1929 Classic. Bob Gibson was the obvious choice for St. Louis in Game 7 and Lolich was given the monumental task of beating him. Both pitchers went head-to-head for six scoreless innings, but the Tiger ace was first to blink after allowing two Cardinal runners on base. (Brock with his record-tying thirteenth hit of the Series and Curt Flood adding a single) Despite the mental setback, Lolich remained focused and struck out the following batters to snuff the Cards' first scoring opportunity. Then, with two out in the Detroit seventh, Norm Cash and Horton both singled. Northrup then hit a long rope to center field that Flood accidentally misjudged. The result was a two run triple and Bill Freehan made it three after doubling home Northrup. Not to be outdone, the Cardinals responded with a run in the ninth thanks to Mike Shannon, but it was too little too late and had been matched by Detroit in their half of the inning. In the end, Lolich had beaten the odds (and the mighty Bob Gibson) with a five hit, 4-1 victory that gave the Tigers their first championship crown since 1945. Detroit also became only the third team in World Series history to rally from a 3-1 deficit to win in Game 7. 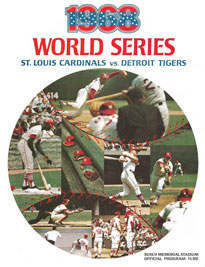 1968 has often been referred to as "the year of the pitcher" and the World Series was no different - Denny McLain of the Tigers, a thirty-one game winner during the regular season, versus Bob Gibson of St. Louis, a 1.12 earned run average champion. But, did you know that the World Series Most Valuable Player Award was won by Mickey Lolich who won three of his team's four games and hit the only home run of his career during Game 2 ? During the 1963 World Series , Sandy Koufax struck out a record fifteen batters. 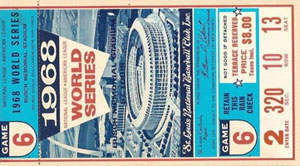 In Game 1 , Bob Gibson had struck out thirteen batters through seven innings and fans could sense a new World Series record . Eddie Mathews pinch hit in the eighth-inning and was struck out making him the fourteenth "k" of the day. In the ninth inning, Gibson allowed a leadoff single then regained his composure and set the record by striking out the side — Al Kaline , Norm Cash and Willie Horton . Game 7 had the undefeated Mickey Lolich , 2-0 during the Series, pitching against the undefeated Bob Gibson , also 2-0 in the Series. Neither would disappoint and through six innings each was tossing a shutout; however, during the seventh inning the Detroit bats came alive with two outs and three runs were put on the board ensuring a Tigers World Championship.